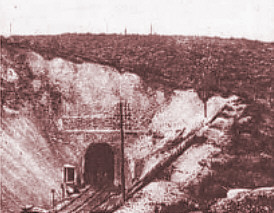 Tavannes railway tunnel stretched from the battlefront to the French rear areas and was reached by a narrow cutting. This gave cover to the French troops approaching the front line, a degree of cover to the staff, storage for vast amounts of ammunition, and even a space to lie down. It was a dark, utterly fetid existence, not helped by the absence of any sanitary facilities except for the track drainage ditches which ran beside the useless rails and which rapidly became stagnant. It was not a good place to spend time but at least it was cover from shellfire for some three thousand men. But on September 4th the ammunition in the tunnel blew up and the fire burnt for days. The French suffered a disaster similar to the German troops occupying Fort Douaumont in May earlier in the year. Officially 500 men died. In practice nobody knows the death toll. The relative quiet on the battlefield continued but behind the scenes Petain's major offensive was taking shape. It included the introduction at Verdun of two massive 400mm howitzers, greater in performance than anything yet seen. 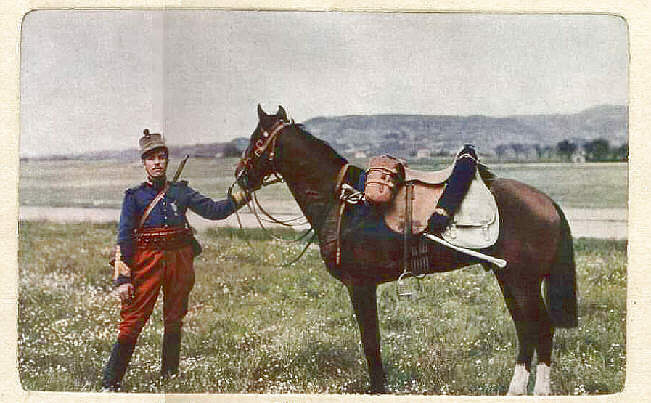 A replica of the battlefield and of Fort Douaumont was constructed near Bar le Duc at the south end of the Sacred Way, and the assaulting troops trained and trained until they knew their exact instructions. Tanks! Haig had a problem. 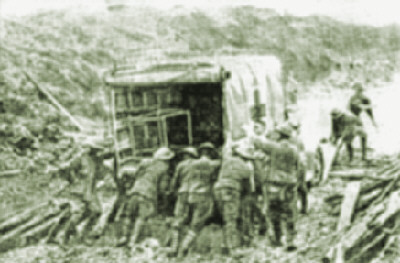 Should he wait until 1917 to use these huge lumbering 27-ton monsters, or should he use them now in an attempt to break the ghastly deadlock on the ridges blocking his way to Bapaume, originally scheduled to be taken on the first day. That was a long time and many men ago. He chose to use them now and at the battle of Flers-Courcellette on September 15th they went into action for the first time. They were successful given their small numbers, but the Germans were quick to recognize their weakness which was their slowness on bad ground and, later, their weak armour plating. However the infantry losses in this battle were lighter than previous and it was thought to be a success. Villages were now mere brick stains on the churned soils and woods now mere piles of matchwood. The entire battlefield was a stinking abomination of desolation, without movement during the day and alive at night when men were relieved, the guns fed and supplies brought up. Of course both sides knew what was happening and the likely routes that men and transport would use, and the gunners of each side would commence firing at all known roads and tracks. Both at Verdun and on the Somme they immediately ordered that the policy of counterattacking cease and although all German held ground was to be properly fought for if lost, a defence line should be constructed to the rear of that place instead. And so the battle lurched slowly and painfully across the fields of Armageddon at enormous cost to life, limb and sanity of all the participants. In Great Britain, the arrival of the telegraph boy was dreaded, with his notification of death, and the postman eagerly awaited with, hopefully, the brief small postcard confirming that the man of the house was still alive. On the Somme it began to rain. Stephen Harris Stephen Harris has just completed his third in a series of studies of regiments of the American Expeditionary Force having an association with New York City. His latest work features the Fighting 69th [165th Inf. ; 42nd Rainbow Div.] and their beloved Chaplain, Father Francis Duffy. 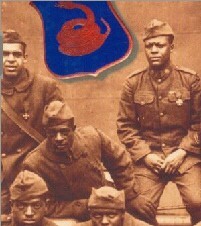 His earlier works studied the 107th Silk Stocking and 165th Harlem Hellfighters regiments. Click here to read our interview with Stephen. Terry Deary's Horrible History series is a long running children's book sequence that threatens to give its reader 'history with the nasty bits left in'. Each book covers a period of British history with titles such as The Vicious Vikings, The Cut-Throat Celts and The Measly Middle Ages. The books are aimed at children aged 8-12 and tend to also coincide with the periods of history they may be being taught in schools as part of the National Curriculum. Each one contains a rough timeline, and a selection of gristly, puerile or simply odd facts about history, illustrated in by Martin Brown with cartoons, largely consisting of historical people expressing more facts, ideas or bad historical jokes. 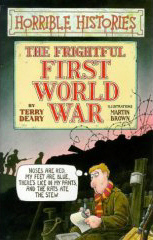 There is of course a version dedicated to World War One: The Frightful First World War. It claims to be 'So horrible that some boring old fogies think young people should not be told the whole, terrible truth'. This book came slightly late on in the series, when most other periods had been covered, and one can sense the hesitation about wanting to write what seems to be, on the surface, a flippant, cartoonish book about one of the most bloody (and indeed, truly horrible!) wars that has ever taken place. In fact, The Frightful First World War is one of the most interesting history books about the war that I have come across. Obviously, it is not particularly serious, but that's what makes it so interesting. It is also, like all of the other books in the series, ready to poke fun at almost anything it can. Finally, it professes to tell 'the whole, terrible truth', despite the fact that 'the truth is pretty nasty'. 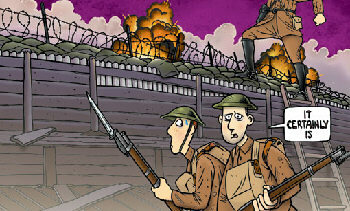 The Horrible History series has been a small godsend to schools and school libraries. By professing to tell the bits of history your teacher was afraid to, the books also throw in a good chunk of 'proper' history at the same time. Whilst readers learn the strange stories that soldiers told each other during the Battle of the Somme, they are also, of course, getting a good dollop of information about the Battle itself. What I like about the books is that although they show immense respect to the war, they do not sentimentalise it - either in terms of its horror or through literary visions. Indeed, the second page tells its readers the only way to understand it is by reading letters from people who were there. At the same time, the fact that the book revels in telling readers that DORA made it illegal to whistle in the street after 10pm for a taxi, or that peeing on a sock was ordered as a preventative for early gas attacks, means that the war is presented as simply another historical period to be uncovered. The book, like so many other war books before it, professes to tell the 'truth'. However this time, it offers a series of facts which may be rather irreverent, but are nevertheless accurate. It does not tell the reader that they will never learn the truth, and the fact that it creates the overall impression that this is simply some of the history available also gives the reader the potential to go further. And finally, quite simply, the history in it is amusing, interesting, and often original. History has never been so horrible! First published in 2005, this is a new look at one of The Great War's bloodiest campaigns, actually 12 battles extending over nearly five months from July to November 1916 and blending almost seamlessly into the ensuing Battle of the Ancre. More ink has probably been spilled in English on the Somme than on any other single campaign on the Western Front of 1914 to 1918. This time, however, the author examines the battles from the German point of view, drawing on surviving German archives and accounts. Each chapter is accompanied by detailed maps pinpointing the positions of the German units and participants whose recollections are quoted. This is a well-crafted monograph written by a former serving German-speaking officer, and based on solid scholarship. Sheldon adopts the style of Martin Middlebrook and Lyn Macdonald drawing heavily on the diaries and memoirs of German participants. He also includes useful appendices giving the German 1916 order of battle on the Somme, an explanation of German rank structure, a summary description of the organization and training of the conscript German Imperial Army of 1914 and its wartime evolution, as well as an essay on sources. 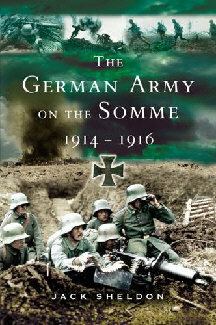 Working chronologically, the author begins with a chapter outlining the shift from war of movement to static trench warfare in 1914, then traces the course of the 1916 battles and ends with analysis of the condition of the German Army as the battle wound down with both sides exhausted in October and November 1914. In all, the author sees the Somme battles as the beginning of the end of the German army in the West. German dead and wounded on the defensive nearly equaled those of the attacking BEF. The German high command can be faulted for maintaining an inflexible defense and for mounting repeated, costly and often unavailing counterattacks. Less able than the British to replace heavy casualties or train new recruits to the high standards of 1914 battleworthiness, Germany was after the Somme forced more and more to rely on desperate expedients such as unrestricted submarine warfare which simply contributed to ultimate defeat. On the other side, the BEF used the lessons of the Somme to improve its tactics and achieve in 1917 virtual parity with its adversaries and in 1918 victory in successive battles of attrition. The German Army on the Somme, 1914-1916, Jack Sheldon, Pen & Sword 2006, maps, appendices, bibliography, notes index, 432 pages, ISBN 1 84415 269 3, $31.50 cloth. 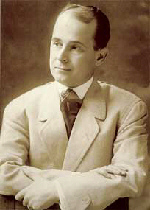 Winsor McCay (1867-1934) is generally considered the greatest of the early animation filmmakers. J. Stuart Blackton's Humorous Phases of Funny Faces (1906) and Emile Cohl's Fantasmagorie (1908) preceded McCay's efforts. McCay's first cartoon was Little Nemo (1911) and this was the first animated film to feature newspaper-based comic-strip characters. McCay's Little Nemo in Slumberland was a regular full page Sunday feature in the New York Herald. McCay was born on September 26, 1867. Accounts vary as to whether he was born in Canada or in Michigan. 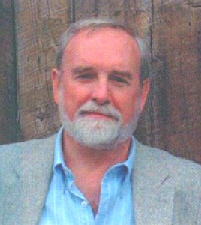 In any case, he grew up in Michigan and attended business school in Ypsilanti as teenager. During this time he took private art lessons from Professor John Goodison of Michigan State Normal (now Eastern Michigan University) and worked as a portrait artist in a dime museum. He worked in Chicago designing circus posters and then moved to Cincinnati where found work as a poster painter/publicist for the Vine Street Dime Museum, a permanent freak show in the city. He married fourteen-year-old Maude Leonore Dufour (1878-1949). Their son Robert was born in 1896 and their daughter Marion was born in 1897. In Cincinnati McCay was employed as an illustrator on the Commercial Tribune newspaper and the Cincinnati Enquirer where he in 1903 collaborated with George Randolph Chester (1969-1924) on creating a prototype comic page, A Tale of the Jungle Imps by Felix Fiddle. Some of these early strips have recently been found and are in the collection of Ohio State University. He was then hired by the New York Herald where he worked on several comic strips before creating Little Sammy Sneeze and Dream of the Rarebit Fiend in 1904. 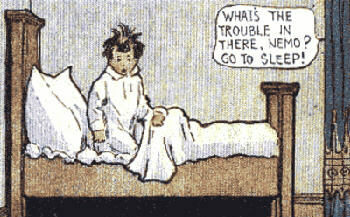 His masterpiece, Little Nemo in Slumberland first appeared in 1905 and ran until 1911. On June 11, 1906 McCay began a vaudeville act as a quick sketch artist at Proctor's 23rd Street Theater in New York City. W.C. Fields was also on the bill. According to McCay at the orchestra rehearsal Bill Fields "reached into his bag and took out a bottle. . ."Here you are," he said offering me a haymaker. "A little scotch for my little Scotch friend. . ." The orchestra was playing my introductory music and I faintly heard the stage manager say, "You're on!" Bill clapped me on the back as I started for the entrance. "Lay 'em in the aisles, my little Scotch friend," he shouted after me." McCay's act was a success and he eventually performed it in vaudeville for the next decade. In October 1908, a Victor Herbert operetta Little Nemo based on McCay's comic strip opened in New York City. A post-Broadway tour began in January 1909 and ran until the winter of 1910. In April 1911, Vitagraph released McCay's first animated film Little Nemo. McCay would include a hand-colored film in his vaudeville act. In July 1911, McCay joined William Randolph Hearst's cartoon staff at the New York American. In 1912 McCay's second animated film, How a Mosquito Operates was completed and incorporated into his vaudeville act. In 1914, McCay's third animated film, Gertie the Dinosaur premiered in his vaudeville act at Chicago's Palace Theater. To animate Gertie McCay drew 10,000 images on rice paper. Each paper was mounted on cardboard and then the images where photographed a frame at a time. Gertie is considered to be the first cartoon with a storyline featuring a star with a personality. Gertie was a dinosaur with emotions that cried and danced and disobeyed. She interacted with McCay's commands and remarks during his vaudeville act. Audiences had never seen anything like it. It's a delightful cartoon and watching it reveals the origins of all the cartoon characters that have followed in Gertie's rather large footsteps. While on a summer vaudeville tour in Detroit in 1916, McCay revealed in an interview that he was working on a film which would show the sinking of the Lusitania. The Sinking of the Lusitania consists of 25,000 drawings produced on transparent celluloid "cels" instead of on rice paper. 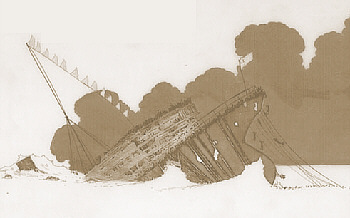 The "cel" technique allowed McCay to use the same backgrounds with redrawing each scene as had been done in Gertie. While more expensive than rice paper, using "cels" saved time and effort without sacrificing art. Even so, it took twenty-two months to complete and eight days to photograph the short film. As usual, McCay financed the film himself. It would net only $80,000 after years of theatrical distribution. The Sinking of the Lusitania was released on July 20, 1918 by Jewel Productions and was advertised as "the picture that will never have a competitor-will burn in your heart forever! Winsor McCay's Blood Stirring Pen Picture-the World's Only Record of the Crime that Shocked Humanity!" There are some remarkable effects in this early masterpiece of propaganda. McCay uses his grasp of perspective as the ominous black conning tower of the U-20 grows in size as it approaches the camera. An underwater scene has two fish darting out of the way of the deadly torpedo. After the attack and subsequent explosion the twisting smoke coming from the funnels of the sinking liner billows out like gouts of spilled blood suggesting the destruction and horror within. The last image of a woman sinking beneath the sea trying to hold her baby up is still haunting. This type of artistic animated propaganda and dynamic camera angles would not be seen again until the Disney studio's work during World War II. McCay's contract with Hearst prevented him from further vaudeville tours and he spent the remaining years producing serious editorial cartoons for Hearst's newspapers. McCay did produce six more films using the "cel" technique. Three survive as fragments: The Centaurs, Flip's Circus and Gertie on Tour. The other three form the Dreams of the Rarebit Fiend series: Bug Vaudeville, The Pet and The Flying House. During World War I, McCay's son Robert and son-in-law Captain Raymond Moniz served in Europe with the 27th Division. Robert McCay was wounded, gassed and suffered from shell shock. He was awarded the British Military Medal and the Distinguished Service Cross. Raymond Moniz was promoted to major for his service with the AEF. Winsor McCay died from a cerebral hemorrhage on July 26, 1934 in his home in Sheepshead Bay, New York. He is buried in Brooklyn's Evergreen Cemetery. 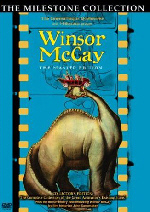 Winsor McCay: The Master Edition is available on DVD from Milestone Film & Video. It includes all of McCay's existing films, the documentary Remembering Winsor McCay by John Canemaker and an extensive stills gallery. Canemaker also provides a very informative audio commentary on McCay's films. Walt Disney Treasures: Behind the Scenes at the Walt Disney Studios was released on DVD in 2002. It includes "The Story of the Animated Drawing" which recreates McCay's vaudeville act with Gertie. The following are thanked for their contributions to this issue of the Trip Wire:Valerie Varos, Stephen Harris, Christina Holstein, Tony Noyes, Esther MacCallum-Stewart, Nicoll Galbraith, Andy Melomet, Len Shurtleff and the highly informative CIA and Library of Congress Websites. Until next month, your editor, Mike Hanlon.